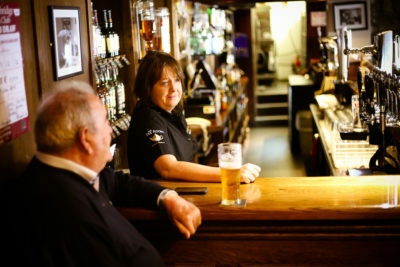 Housed in a building dating back to c. 1650 and steeped in local history, Paddy Burke’s is named after the man who first introduced and sold oysters in the area. Paddy Burke’s also hosted the first Clarenbridge Oyster Festival in 1954; with oysters, music, drink and craic galore being the order of the day. “If you’re not in the mood to get right down to work, have a dozen deep shells with a pint of Guinness from our friend Paddy Burke” Thus, the entry in the visitors book of Paddy Burke’s, penned by a Mr Vickernan in April of 1959. That little book is crammed with the names of the famous, the titled, the infamous and the plain disreputable and it neatly distils over 30 years of the history of one of Ireland’s most famous hostelries. Almost 70 years on Paddy Burke’s has grown and added another fragment to its establishment. We are proud to introduce our new Tearooms. Proudly overlooking Clarin River, facing towards the Atlantic Ocean, one can enjoy a delectable meal, including afternoon tea, in the cosiness of this room whilst also enjoying artwork by local artist, Belinda Fair. We cater for gatherings of all occasions – choose your location to host your next event – either in our dining & bar areas, the Tearooms or on the outside deck. We can also come to you providing you with our private catering services.